Believe it or not, even though I’m a native Northern Californian and have lived here my entire life, I’ve never gotten around to visiting Yosemite. I know my parents have been there — as evidenced by their photographs, some of which I shared in Memory Monday, Week 4 — and it’s definitely on my bucket list. Yosemite has seen quite a few changes over the years; historic Camp Curry is now called Half Dome Village, and the famous Glacier Point Hotel is only a memory, having burned down in 1969. 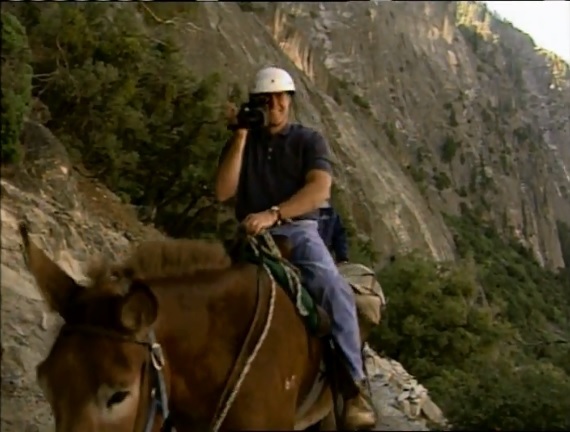 But when Huell visited Yosemite, he found some folks who still remember those days and were only too happy to share what it was like. A shout echoes through Yosemite… “Let the Fire fall”, and from 1872 to 1969 that’s just what happened. Join Huell at the top of Glacier Point with Nic Fiore who was the last to push a pile of burning embers off the edge, creating the beautiful red hot “waterfall” effect known as Firefall. Then down to the bottom at Camp Curry, the best spot to view Firefall, where Huell talks with Keith and Ginny Bee who for 42 years ran the nightly outdoor theater show which led up to the fiery finale of this now lost California tradition.